The iso cuts (yellow lines) leave those little greaterthan/lessthan-shape chunks of rail (red lines) hanging by only one PC board tie. When I Dremeled the iso cut the heat from the disc popped them off and it was a PITA to work them back in. I think Chriss333 recommended cutting the iso's from underneath (turn the fixture over). MC & Chris: thanks for the pointers, too. 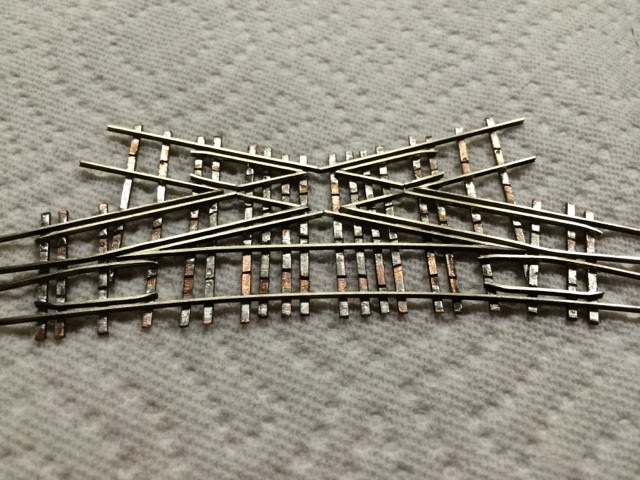 Will be adding more PCB ties, as the guard rails need something to hold onto as well. 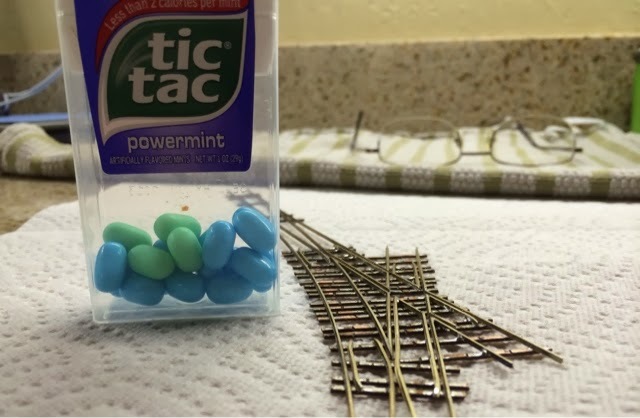 On the bright side, I'm happy to have a few bags of Clover House PCB tie strips handy. Quite happy with the results so far, as I've had a chance to test the "left" turnout above with a few bits of rolling stock. Even old school pizza cutters glide right through soldered code 40 track. 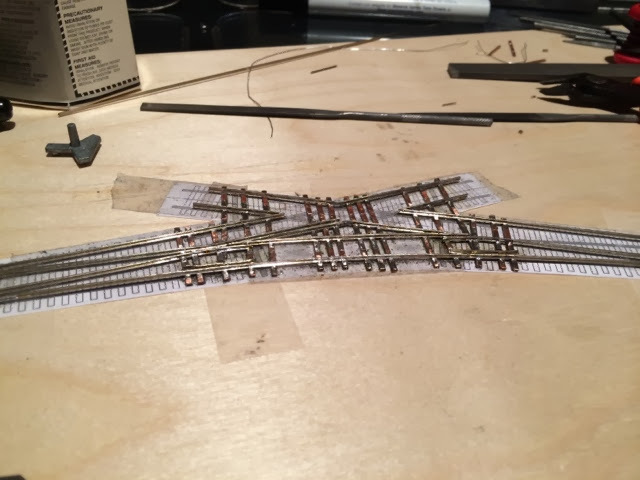 Might just hand lay the whole yard using Jim Lincoln's flex monorail trick (e.g., single rail with pre-attached PCB ties, adding the second rail with the track gauges). Why is the float bridge like that, 3 tracks but you can't put cars on the center track? 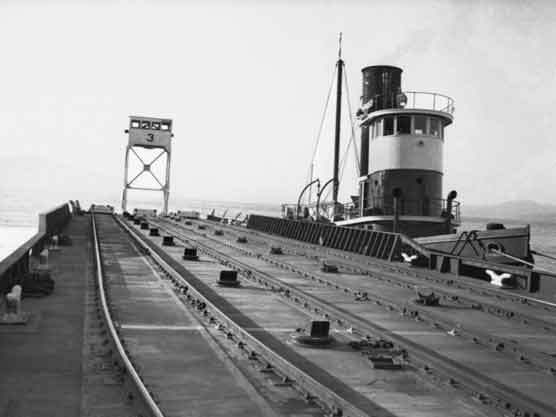 As soon as the rails entered the barge the side tracks spread wider, so you could fit 4-3-4 cars to fill the barge. Not a barge expert, but that is a SMALL barge.. either you would use the 2 outter tracks of the 1 center track. I cant see all 3 of those tracks used at once, moveable rails or not. I cant see all 3 of those tracks used at once, moveable rails or not. Barge was 260' long, 38' wide (at widest), 12' deep. Not sure how that compares to the NYC ones. 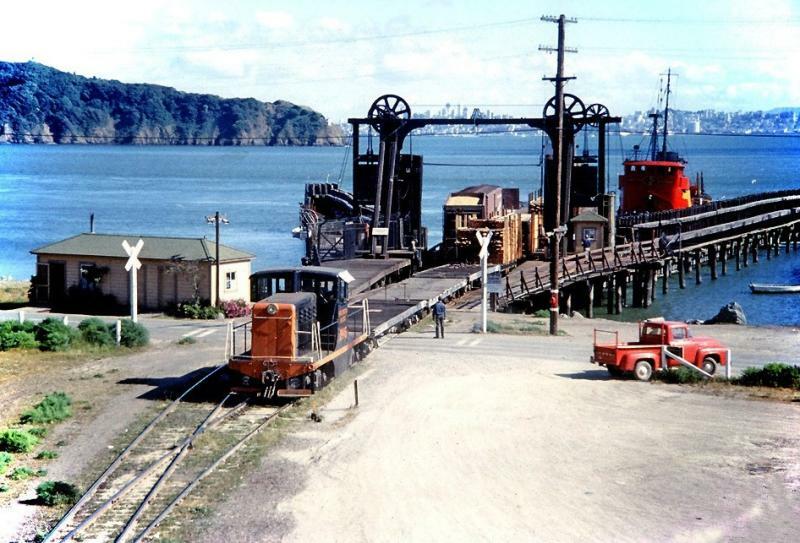 Many, many photos show the barges being shoved with full 11-car loads all over the Bay Area. Famous story: during a storm a bunch of boxcars full of newsprint and a tanker full of Seagrams 7 fell into the Bay. Trucks fell off and sank, but all three boxcars and the tanker floated (alcohol "lighter" than water ), were lashed together and hauled all the way over to Richmond and fished out. While none of the Seagrams was spilled, the boxcars, set on a track to dry out, soon became stuck full of swelling, sweltering newsprint that soon stank. The First Quarter 2011 issue of The Warbonnet--The Official Magazine of the Sante Fe Railway Historical & Modeling Society--is almost entirely devoted to Marine Operations in San Francisco Bay. With barge schematics, track maps, & lots o' photos. That's not the barge in that picture. BTW: Probably worth even more money, because the back issues are no longer available! From what I understand, they switched from two track floats to three tracks floats early on. As MC posted (and Pete Nolan could also confirm) once on the barge, they space out the tracks to handle about 12-16 cars. The slips could either handle 2 or tightly space 3-track floats. 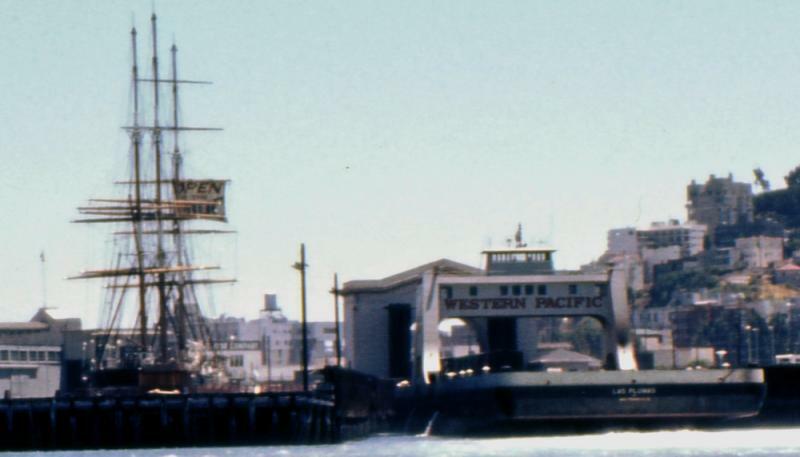 In the early 60s, the WP had a FOUR track ferry, the Las Plumas, which used a 2-track loading system with two turnouts on the ship itself. 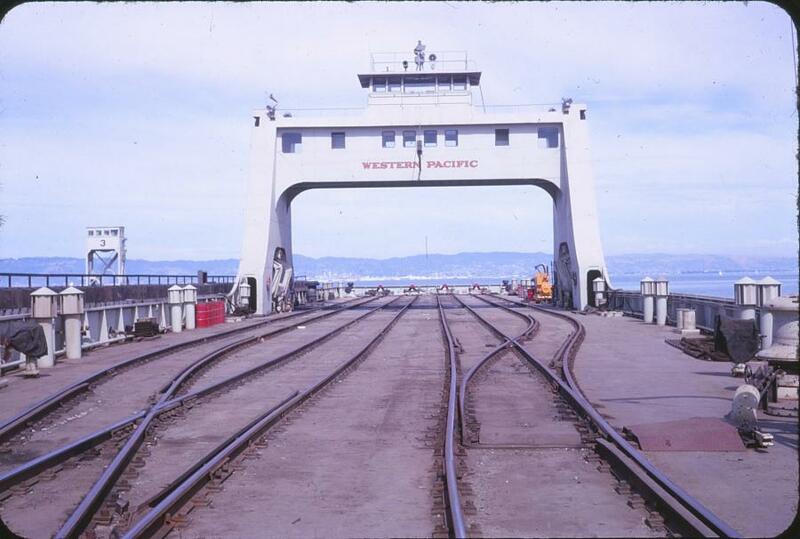 My pictures was of the apron at Pier 52 in SF, whereas MC has posted some pics from Ferry Point in Richmond, CA. There were also car float aprons in Alameda and Oakland. There was also a slip at Tiberon, too.